Justin Gatlin admits a few years ago he would have found it difficult with the Olympics being in a place like Rio de Janeiro — with its beaches, nightlife and myriad diversions. "When the Olympics come around, you can be distracted by the glitz, the glam," Gatlin said. "Especially with the Olympics being in a place like Brazil, which is known to have big festivals, have festive parties and to have a great time." 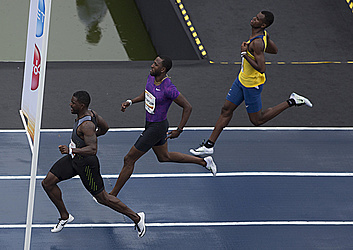 Gatlin was focused on Sunday in Rio and won an exhibition 100-meter race ahead of the Olympics opening in two months. The promotional race was run "on water," a sprint across a 100-meter runway built over a small pond on the grounds of Brazil's former imperial palace — known as Quinta da Boa Vista. Gatlin ran 10.19 seconds in a light rain, off his top time this season of 9.93. After three races in about a week Gatlin, heads back to the United States for training before the American trials in early July in Eugene, Oregon. Gatlin won 100-meter gold in 2004 in Athens and is expected to challenge Usain Bolt, who has won the 100 in the last two Olympics. "I want to go out with a bang," said Gatlin, who has been banned twice for doping violations. "I want it to be one of the most exciting races in track and field history. And I want not just the fans here (in Brazil), but all around the world to stand still for nine seconds and be able to watch the fastest race ever." Asked about running nine seconds, he laughed and repeated: "Yeah, nine-flat." Bolt has the world record of 9.58 set in 2009. Gatlin was asked about the Zika virus, which has its epicenter in Brazil and has been shown to cause birth defects in babies. He said he hoped to show that "Brazil is safe, it's a great place to come." He said few athletes would be deterred. "This is an Olympic dream," he said. "It comes every four years, and sometimes as an athlete you don't get that opportunity again." The World Health Organization has told pregnant women to stay away from Zika areas, although it says the games should not be postponed, as some medical experts have urged. Gatlin must qualify for Rio in the American trials in early July in Eugene, Oregon. Nothing is guaranteed for any American — former gold-medal winner or not. "I don't have that ticket yet," he said. "My family has that ticket. They already have their tickets to Rio. The pressure is on me to be able to make sure I make the team."